Simple paper labels offer good value for money. Hardwaring, tear resistant & weatherproof. Temperature, chemical and humidity resistant. Tear proof, waterproof, durable and moisture resistant. Durable and pliable, well suited for application to curved surfaces. Exceptional durability under a wide variety of environments. Temperature resistant and hard wearing, can be handwritten or stamped. 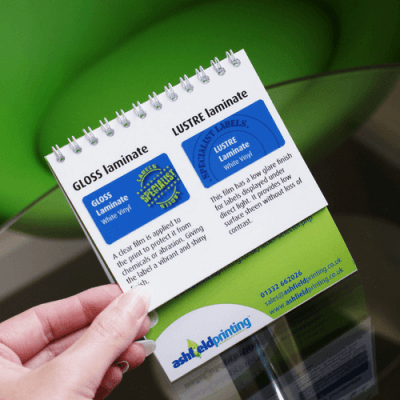 Polycarbonate / Lexan labels offer you an extremely durable label solution. We have access to the UK's largest range of label stock, so you can get a label material that matches your exact requirements! To select a label that meets your exact need first you needs to answer these simple questions. 1 - Where will the label be used? 2 - Does it need to fit into a specific space? 3 - What type of surface is it fixed to? 4 - What is it’s expected lifecycle? 5 - What is the environment like? Get a sneak peap at all the different labels on offer..
Our Label Look Up Guide was created by our resident label expert and is designed to provide an overview to the different materials, adhesives and laminates commonly used in label printing, and to showcase samples of the different types of printed labels on offer.